The original Disney Infinity was a wonderful celebration of some iconic Disney worlds (Pirates of the Caribbean, Monsters Inc, Cars...), but the second Marvel-themed Disney Infinity 2.0 didn’t seem to have as much creativity or, I suspect, as much passion in its design. I hugely enjoyed going through the original play sets, even the slightly less interesting Incredibles one, but the Marvel sets often bored me - and, actually, my partner’s 8-year-old, who is otherwise voracious about anything Spider-Man themed - to tears. Most of the Marvel playsets were a repetitive, methodic sequence of shooting and/or hitting things and hoovering up little coloured pellets. I suspect, based on previous form, that Disney’s marketing department decided that the Marvel play sets were For Boys, and that all little boys like is action and hitting stuff, when neither of those things are really true. The Spider-Man set redeemed things a little with its web-swinging open world, but there was nothing in Disney Infinity 2.0 as surprisingly ambitious as Pirates of the Caribbean, or as inventive as Monsters Inc. (Or as good as The Lone Ranger, which despite being attached to a terrible film, is probably the best Disney Infinity play set - a Red Dead Redemption for kids.) So, frankly, I did not have high hopes for Disney Infinity 3.0 and its Star Wars-dominated slate of play sets. I feared that they would be similarly dumbed down. Rise of the Empire is actually a pretty original Star Wars game, even though it covers the same ground as countless games before it. It features the events you’d expect - the Death Star trench run, taking down AT-ATs in the tundra - but it’s wrapped up in a colourful and surprisingly likeable Star Wars open world, where you run around picking up missions, tooling around in different Star Wars vehicles and riding pretty much every creature you can see. It’s more like the Lego Star Wars games than previous Disney Infinity games. 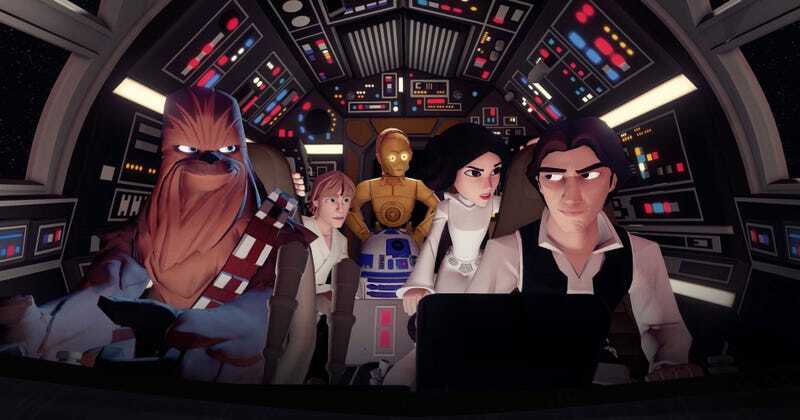 The toylike aesthetic and premise of Disney Infinity has also let Gobo experiment with what would otherwise be predictable scenarios: you’re not playing Star Wars, you’re playing Star Wars as it would be if everything were a toy. So yes, you can circle an AT-AT and trip it up with a tow cable like Skywalker does during the Battle of Hoth, or you can climb up the AT-AT, bash it until the casing falls off, and then remove its batteries. Or you can fly up high, drop down on top of it and control it using the big, friendly buttons on its control panel, sending it crashing into another. It’s delightful, and above all it’s actually fun to play and experiment with, where the Marvel sets could feel rigid and lifeless. Ninja Theory’s Clone Wars-themed set is a straightforward action game - find droids, kill droids, move to next area. What prevents it from being as boring as that sounds is Ninja Theory’s combat expertise - it’s not exactly DmC, but there’s depth to the fighting, with different combos based on differently-timed button presses and air-juggling, and above all it looks REALLY cool. Ahsoka, with her twin lightsabers, is especially fun to twirl around with. Anakin, meanwhile, feels heavier and more aggressive. Little Yoda pings around all over the place. Less impressive is the Inside Out set, which was depressingly described to me by a Disney PR person as “the one for girls and younger families”. Despite being based on a film that is by all accounts incredible, it looks deeply boring and it’s deeply boring to play, too. It is an unimaginative platformer that switches between 2D and 3D and doesn’t even bother to make up a half-decent premise for “collect all the stupid orbs”. I have no expectations for it whatsover; it’s disappointing to see Disney squander the opportunity to make something out of one of Pixar’s most interesting films. Another slightly lacking aspect of Disney Infinity has always been the vehicles: they look like toys, but they feel like toys when you race them, too. There’s no weight. Disney has brought in another British studio, Sumo Digital, to fix this - there’s a whole racing component of the game, now, rather than just the Toy Box creative mode. The new developer has essentially turned it into Sonic & Sega All Stars Racing, which is not a bad thing at all. There are tracks themed around Wreck-it Ralph and Nightmare Before Christmas, amongst others; it’s a more than passable Disney-themed approximation of Mario Kart. It’s the Toy Box that’s the real soul of Disney Infinity, for me - the ability to mash-up different characters, backdrops, vehicles and more into an imaginative world of your own. I am much more into this than my stepson, who is content to let me fiddle around creating things and then turn up and smash as much of it as possible. But the play sets themselves have such potential; turning a wide variety of talented developers loose on Disney properties that they love could have such amazing results. I really hope Disney starts doing this with its less predictable “brands”, too. I would love to see what a good developer could do with Frozen, The Lion King, or Big Hero 6. In the meantime, its treatment of Star Wars is looking significantly better than Marvel.